The plaque commemorates those who served in the 2nd / 3rd Field Regiment during World War Two. The 2nd / 3rd Field Regiment was an Australian Army field artillery regiment that was raised for service during World War Two. Formed in 1939 and assigned to the 6th Division, the regiment was deployed to the United Kingdom to defend against a possible invasion in 1940 before being sent to North Africa, where it briefly saw action prior to being sent to Greece and Crete in 1941. In 1942, the regiment returned to Australia, after which it did not see action again until late in the war when it was committed to the Aitape–Wewak campaign in 1944 and 1945. 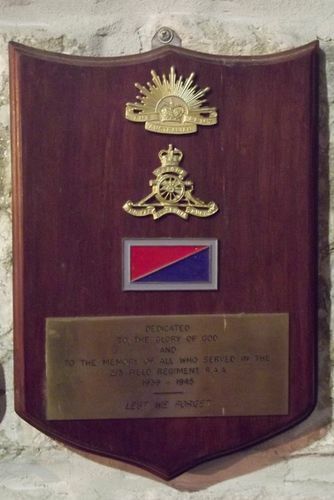 Following the end of the war, the regiment returned to Australia and was disbanded in January 1946. 2 / 3rd Field Regiment R.A.A.